Today started nicely, with some clear skies and very warm sun through the early afternoon… and then came the rain. Scheduled to keep dribbling / pouring until 4pm on Sunday you’d think it would dampen spirits but thankfully that idea was put to rest by the dedicated fans cramming into tents or simply ignoring it at the main stage. 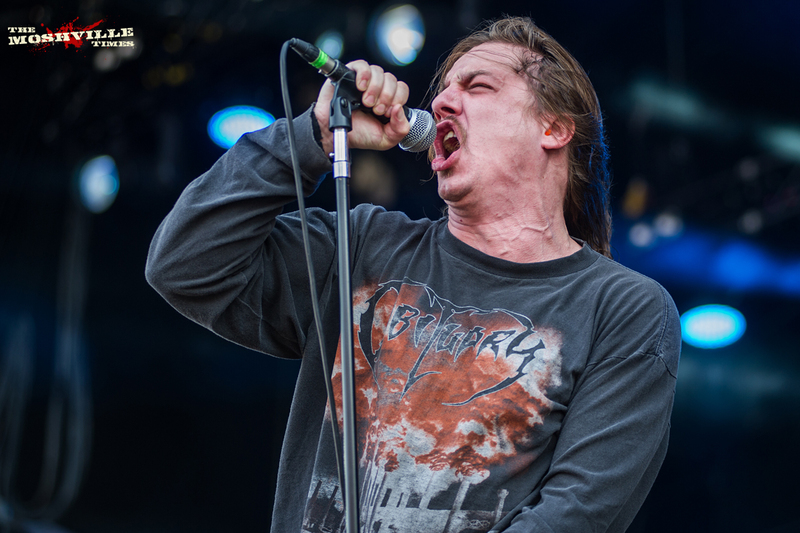 The first band of the day for me, in a gap between interviews, was Power Trip. Who are from Dallas, Texas and you better not forget it. I first heard of these when our News Ed Max caught them a year or so ago and wouldn’t shut up about them. Turns out he was justified. Power Trip don’t reinvent the wheel when it comes to thrash metal, but when that wheel has been perfected for many years, runs smooth and is reliable then why would you muck with it? Vocalist Riley Gale was clad in an Obituary shirt and Slayer jogging bottoms and, in short, that sums up the band’s influences. A huge crowd for an early show, they absolutely blew away any cobwebs and had the audience headbanging, moshing, circle pitting and wall-of-death-ing in the blazing sunshine. I managed to catch snippets of a couple of other acts. Dead Label played the best set I’ve ever seen from them in the SOPHIE tent, Aonia blew me away in the New Blood, Vola enthralled back on the SOPHIE and Combichrist were a revelation on the main stage. 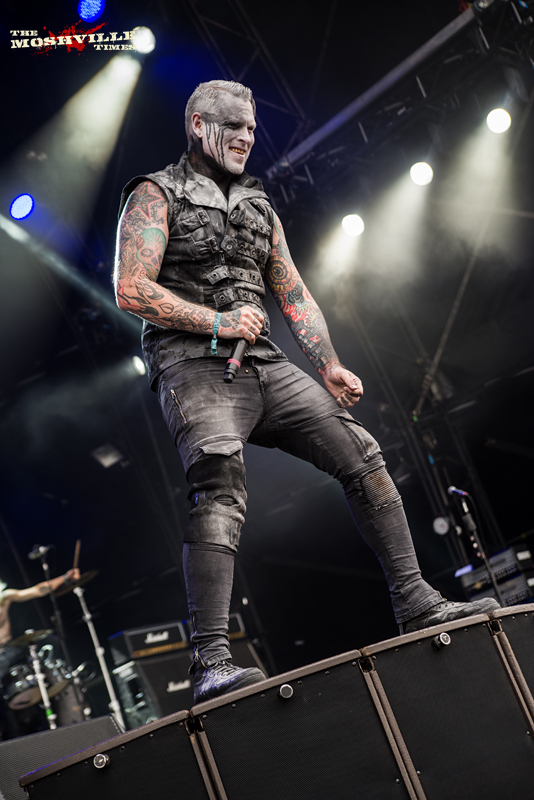 Having last seen them several years ago at Glasgow’s now-defunct Arches venue, the dance/rave/electro/industrial combo were an unstoppable party monster at Bloodstockthis year. With two percussionists, a guitarist, a keyboardist and a frontman they hit the right note with the entire crowd and had a huge number of people bouncing, raving and basically having a great time. Following them with Alestorm was the perfect decision, simply keeping the party going with a different record on the turntable. As one audience member said to me, they’re “the quintessential party band” and I can’t argue. People and inflatables floated over the crowd as the audience alternately rocked and laughed out loud to Chris Bowes and company’s japes. A small stoppage to check on a fallen comrade (“Is anyone dead down there? Please don’t be dead”) and Rum Ahoy’s Captain Yaarface joining the band on stage for “Hangover” just added to a predictably enjoyable show. Disclaimer, I’ve known two members of Valafar for over 15 years but this is the first time I’ve seen them live. They were supposed to play our stage at Wildfire last year, but they broke their drummer so I just had to head for the New Blood to see Yorkshire’s Metal 2 the Masses champions. I’m glad to say they were worth the wait, throwing down some incredible heaviness while managing to get the audience sat down for a friendly longboat row before Alestorm did the same thing half an hour later. Cannibal Corpse didn’t let rain stop play, and a huge crowd went completely mental. With half of them wearing Hawaiian shirts (in homage of Corpse’s Ace Ventura appearance, due to an online idea probably posted by someone who owns a Hawaiian shirt business), the bedraggled audience moshed and crowdsurfed for the entire length of their brutal set. Joyous both to behold and take part in. 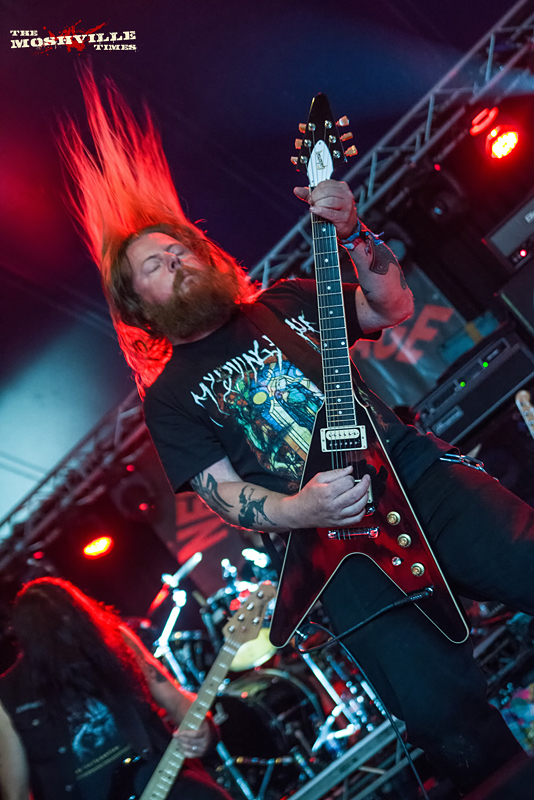 In the runup to the headliners, Exhorder went all old school thrash in the SOPHIE tent, playing to an audience who definitely weren’t just hiding from the rain. The stampede from there into the main arena for Gojira was something to behold, and the French act strolled purposefully on stage to an enormous cheer. Within the first couple of songs, they’d fired up smoke cannons, blasted flames skywards and set off fireworks. 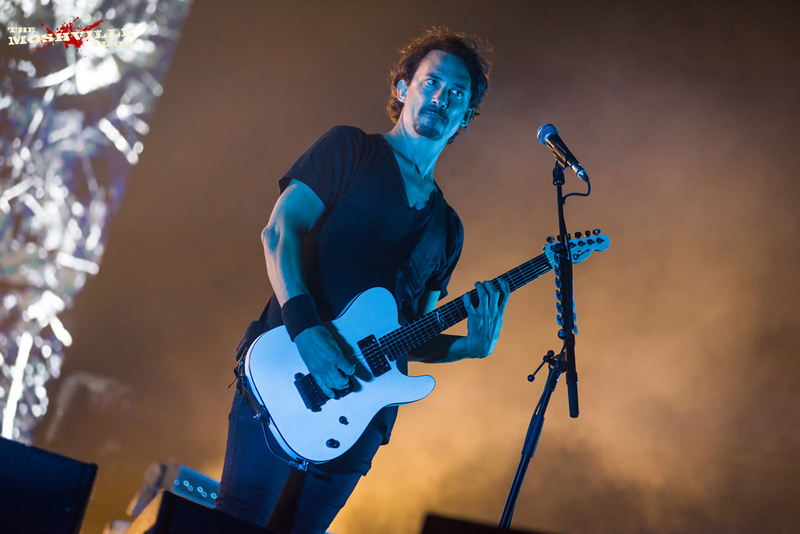 I confess I’m not a fan – I just never caught the Gojira bus – but there’s no denying their incredible stage presence, and the thousands watching tonight were justifiably lapping up every minute.